An engagement ring, that small, precious thing many will wear every day for the rest of their lives, carries a lot of emotional weight. It symbolizes a couple’s love and commitment to the world. It shares their history, and their hopes and dreams. And then there’s the cost: according to The Knot 2016 Real Weddings Study, consumers in the market for diamond engagement rings spent an average of $6163.00 in 2016. 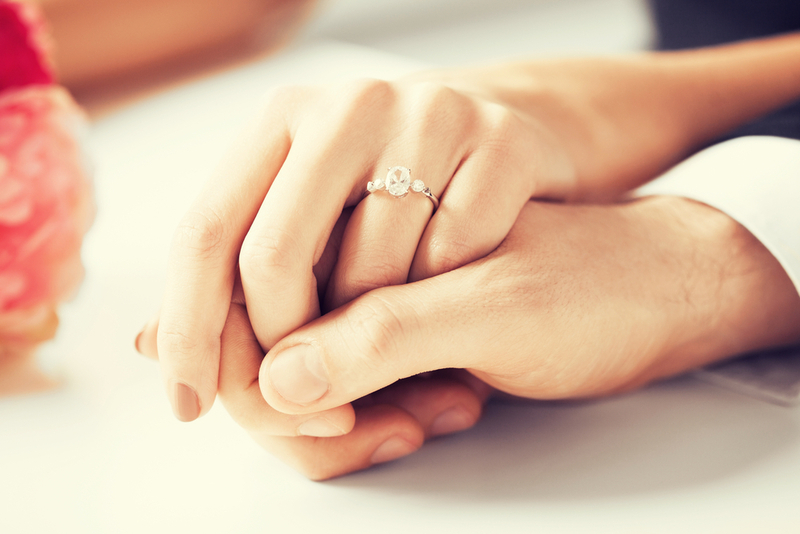 It’s no wonder that you may view the task of buying an engagement ring with apprehension. Luckily, if you’re the one buying the ring, you don’t have to make this purchase alone! Many modern couples choose a ring together, or prefer the experience of working with a jewelry designer. This helps them envision a custom engagement ring, and wedding bands, that they will surely love. And if your intent is to surprise your beloved with a beautiful engagement ring, our talented staff can work with you to help you choose or create a ring that will leave her speechless. For the over 20 years we’ve been in business, we’ve guided customers through the process of finding the right engagement ring. We carry a wide selection of engagement rings, both new and vintage. Our selection includes round brilliant cut diamond solitaires, marquise cut, princess cut, and old cut diamonds. If our choices seem overwhelming, don’t worry! We’ll be there with you every step of the way towards finding the perfect ring. We’ve included some brief descriptions below – just in case. Round cut diamonds exhibit the brilliance of a stone by reflecting the most light. Perhaps this is why round cut is among the most popular classic styles for engagement rings. They are also incredibly versatile: this shape will fit into nearly every type of setting. In fact, if you have an old family ring it’s diamond is probably round cut. Marquise cut is a unique style that rose in popularity in the 1980s, and is seeing a comeback. Marquise cut diamonds are almond-shaped, and can be set either vertically or horizontally. They can be placed in a variety of settings, and look beautiful with jewels set on either side. Princess cut diamonds are square-cut and can look either classic or modern. They can sit alone or in a setting with other stones. If you and your sweetheart decide you want a vintage engagement ring, the choices may seem endless! Browse styles online for inspiration, or come into our shop to check out some sparkling vintage beauties. These days, designers often take inspiration from creative vintage styles, so if your wish is to get a custom engagement ring, then bring in some photos of vintage styles you like. From the floral ballerina style to sleek art deco; there are countless styles and design touches waiting for you to explore. If you think you want a custom design, don’t worry if you don’t have a specific idea of what the finished piece will look like. Design is an intuitive, organic, collaborative process. By the end, you’ll have something more beautiful than you could ever have imagined! Our friendly and talented staff can accommodate your needs – whatever they may be. Whether you want to purchase a ring, or create a custom design, we can help you. If you have an older ring and need a new, updated setting for the stone we will work with you to create an entirely new piece sure to stun. For those forward-thinking couples, we also have a large selection of men’s and women’s wedding bands in white & silver gold, platinum and titanium with and without diamonds. Stop by our store at 14718 Main Street in Upper Marlboro, MD to browse our selection and chat with our staff about what you have in mind or give us a call at 301-574-4400 .